The Northwestern Connecticut Dog Club Inc. works with the community to promote responsible dog ownership and educate the public about AKC events and services for the general public. We are available to assist you in many ways from distributing flyers and brochures, putting on demonstrations, and presenting programs to schools and youth groups, to simply answering questions you may have about acquiring a new dog or improving your relationship with a dog who is already a member of your family. Although most AKC events involve purebred dogs, our public education program extends to all breeds, including All American mixed breeds. Does your community have a fair or an extravaganza scheduled in the near future? NCDC is available to host a table or booth with information about selecting and buying the right dog, training your dog, dog health, and the many activities that you can participate in with your dog. All of our volunteer dogs have been trained to work with the public and have passed their Canine Good Citizenship evaluation. Within our club we have many years experience in a variety of dog sports and activities, including obedience, tracking, RallyO, agility, carting, sledding, and weight-pulling. We would love to demonstrate these sports to your organization. 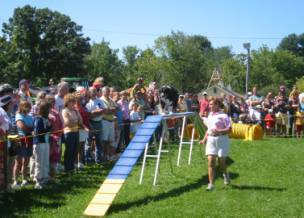 Dogs in action are always a crowd pleaser! Invite a Canine Ambassador to make a presentation to your class or group today! Canine Ambassadors are AKC-affiliated club members who make classroom presentations to children about responsible dog ownership, canine safety and a wealth of other topics. 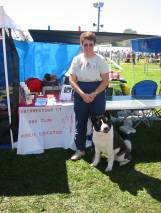 The Canine Ambassador usually makes presentations with an AKC-registered purebred dog. Ambassadors work with a teacher or youth group leader to tailor presentations to best meet the needs of the children. Presentations are made in classrooms, auditoriums or gymnasiums. Depending on weather conditions, Ambassadors may also hold outside presentations. This program builds on a child’s natural love of dogs and explores the concept of responsibility by discussing the realities involved in owning a dog—from feeding and grooming to training and veterinary care. It includes a video and activity sheets. when that dog is their own family pet. This program ties in nicely with Stranger Danger programs. Our Canine Ambassadors would love to visit your youth group. All of our dogs have current vaccinations and have passed the Canine Good Citizenship evaluation. Many of our dogs are also registered Therapy Dogs and have experience working with children with disabilities. CGC is a certification program that is designed to reward dogs who have good manners at home and in the community. The Canine Good Citizen Program is a two-part program that stresses responsible pet ownership for owners and basic good manners for dogs. It is open to all breeds, including All American mixed breeds. Dogs who pass the 10-step CGC test may receive a certificate from the American Kennel Club. NCDC has several members who are certified to administer the CGC evaluation. Check our Calendar of Events to find a test date, or contact us to schedule an evaluation at your event.